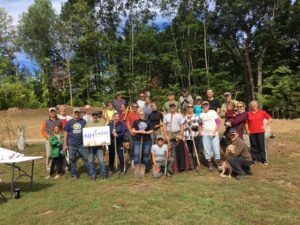 Over 25 volunteers arrived Saturday morning, the first day of Fall, to help prep the donated space on the hillside next to Frosty Scoops for NH Solar Shares’ first community solar PV array. With tools in hand volunteers, leveled the dirt, backfilled around the new concrete pads, moved woodchips around the earth screws that Revision Energy recently installed and cleared the hilltop picnic spot that overlooks the soon to become solar picnic area and the Common Man Inn. Fueled by donated coffee from Dunkin Donuts, an early business sponsor, and veggie burgers from the Common Man, the volunteers were able to accomplish a lot of site work including a short nature trail behind the solar arrays. By the end of October, two picnic pavilions housing 21 solar panels each and three steel ground mounted arrays with 16 panels each will generate clean renewable energy for households who wouldn’t otherwise have access to solar energy and the savings it produces. “The community support has been amazing, I can’t stop smiling today watching how hard everyone is working. There’s no doubt about it, people in our community care about the environment and each other!” said Sandra Jones, project manager and director of the Plymouth Area Renewable Energy Initiative. The project leaders, contractors and volunteers are committed to finishing the project by October 31st, the deadline for the US Department of Energy’s Community Solar Challenge. This one of a kind project is positioned well to compete in the $100,000 national prize competition. If NH Solar Shares wins, organizers say the funds will go to building two more solar projects in the region. The Plymouth NH Solar Shares project has been made possible in part by grants from the NH Renewable Energy Fund, the NH Charitable Fund, the NH Community Development Finance Authority Business Tax Credit Program and the NH Electric Cooperative Foundation. To learn more, volunteer or to donate, visit www.nhsolarshares.org.